The UK's Met Office is using Google Maps to display dust observations collected from weather stations across the UK. Currently the map is displaying observations for Friday and Saturday of last week. If you click on any of the mapped weather stations an information window will open with the results of ash detection. Most of the observations come with a time of detection and report at what altitude the dust was detected. 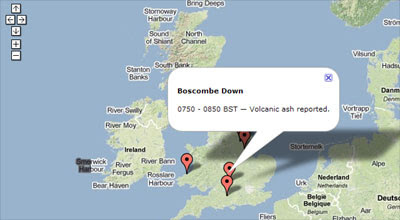 Currently there seems to be only one report of ash detected at ground level on the map. This is from Epworth on Saturday, which informs of a 'report from public of ash covering cars'. It now shows multiple days under different tabs.